There have been tense scenes in Calais as hundreds of migrants queued to be registered after leaving the so-called “Jungle” camp. Demolition work is due to begin on Tuesday. While paramedics attended to one person who fainted, others pushed forward as police tried to maintain order and volunteers helped to keep the crowd calm. From early morning on Tuesday there was a rush for the gates. Dozens jumped over barriers in an attempt to join a queue leading to the temporary processing centre. One young man from Pakistan said he had given up trying to reach the UK, and saw his future as being in France. The 25-year-old explained that he hoped to return to university and find a job in France. 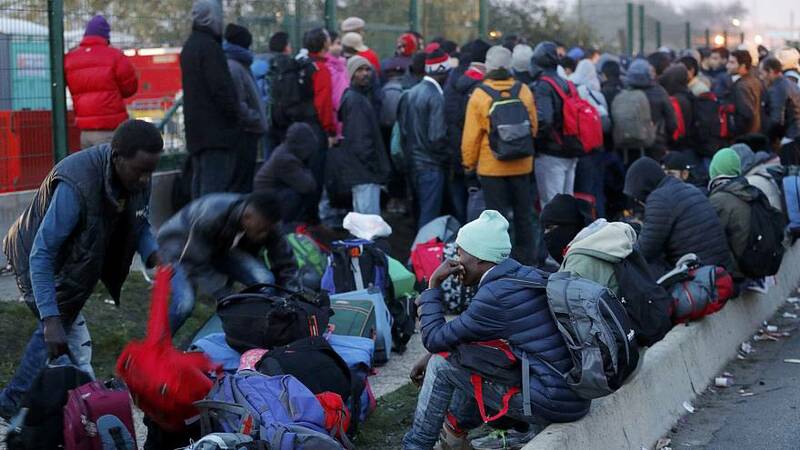 On Monday over 2,300 people – more than a third of the total – left the shanty-town outside the northern French port to be rehoused elsewhere in the country. The French government says it is closing the camp on humanitarian grounds. About 7,500 beds are being made available in 450 centres across France. So far migrants have been taken to seven regions including Auvergne – Rhone-Alpes, Bourgogne-Franche-Comte, Brittany and Nouvelle Aquitaine. The government’s resettlement plan, along with the camp and border controls with Britain, have become heated issues six months before a presidential election. Some right-wing opponents of President Hollande want all the migrants transferred to Britain, and border controls moved back to the other side of the Channel. The anti-immigration Front National believes the resettlement plan will create mini-Calais camps across France. Some aid workers have warned that migrants who become disillusioned with the process will simply regroup later elsewhere in the Calais region. Many of the migrants who have been living at the camp are from countries such as Afghanistan, Syria and Eritrea and had wanted to reach Britain, which is connected to France by a rail tunnel. Britain, however, bars most of them on the basis of European Union rules requiring them to seek asylum in the first member states they set foot in. Some claiming to be unaccompanied minors with relatives in the UK still want to reach Britain. London and Paris have been at odds over their fate, while there has been a fierce debate in Britain over the age of some of those being allowed in. On Monday the British government agreed to take in roughly half of the camp’s children who are alone.